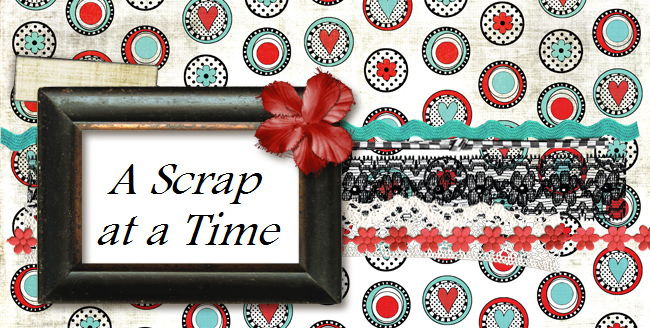 Welcome to the My Scraps and More Ring In the New Year Blog Hop!! There is something about the New Year that gets everyone motivated to get things done. We want to help you get your scrappy mojo going in the New Year. This is our first ever Blog Hop for the My Scraps and More Sketch Blog. Here is our special blog hop sketch. I created this page of my middle son with Santa when he came to visit the school. Along with the sketch I used a combination of Simple Stories December Documented and Echo Park Very Merry Christmas. Now hop along to the rest of the design teams blogs to see how they are Ringing in the New year with this fabulous sketch. Make sure to leave a comment on each Design Teams blog and then see what you can create with the sketch. Link it back to the My Scraps and More sketch blog by Thursday, January 9 at midnight EST to be eligible for this fabulous prize. Now you actually will have two chances to win. If you complete the sketch by the blog deadline you are eligible for the blog prize but you also have the entire month with several more sketches to come to be eligible for the monthly sketch prize. Here is the order of the hop in case you get lost along the way. Now hop on over to Tammi's blog to see what she did with the sketch. Fabulous Christmas layout!!! Love your take on the sketch!! Great use of the twine and great take on the sketch! Love the 25 and holly! great take! What a wonderful Christmas page! Love the mix of papers! I'm ashamed to say this is my first time visiting your blog, Tracy. I just LOVE your decorating style! Those bolts of ribbon are so graphic and cool! Love this sketch, too! 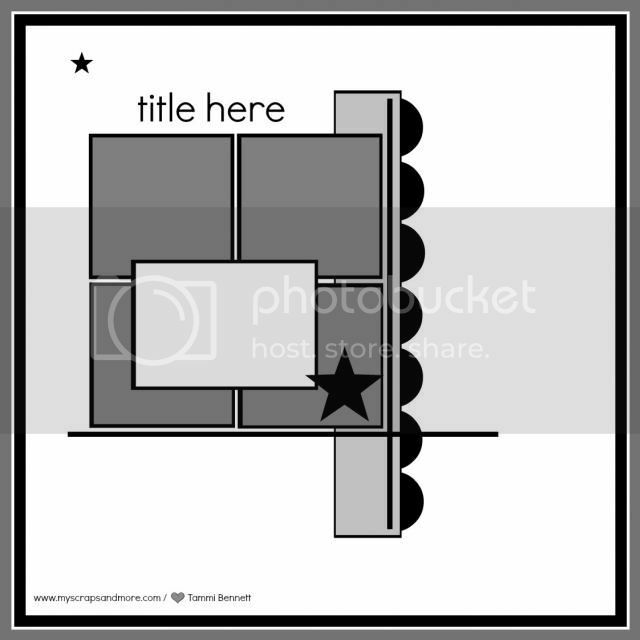 And your example layout is awesome. Darling photo .. and that little touch of tied twine around the photo is so fun! I'm may have to snoop around here for a while ... if you don't mind. ;) I see LOTS of inspiration here! This is awesome, Tracy! I love this SS collection...and I love the way you used the papers for the grid and the arrow stickers on the side! Love it Tracy, I like how you switched the sketch. Super cute page! Fun! Love the chevrons down the side. Very cute page! Love the distressed edges and the papers you used! great christmas page and LOVE the arrows down the side!!!! I love the bits of black/chalkboard paper! Fun! This is a great Christmas LO! Great take, Tracy! Love the chevrons and distressing. What an awesome Christmas page, love the arrows on here! Love your mix of papers on this wonderful Christmas layout, Tracy! What an awesome Christmas page! Thanks for the inspiration! Great take on this Christma photo. Love your work. Like how you flipped the sketch to make it work for you! That is really cool in the bottom right quadrant with the date changing like that! Love it! the way you used these papers and the embellies is incredible. Fantastic work! I luuuv the arrows going down the side, great great take on the sketch! Very cute! I love Santa pics. Great take on the sketch. Love the chevron border, Tracy! This is wonderful, Tracy! I love the chevron border and your squares. Love how you used the sketch here. Great inspiration. Great layout, love how you used the twine! Love how you urned the sketch. Great Christmas layout, I so struggle with those! Love this. Such a great job with the sketch. I love the distressed edges of the papers too. Beautiful page! love your take on the sketch. the distressing adds so much and so is the baker's twine. What a sweet layout (probably not the word he would want to hear) Really love the papers! I love seeing Christmas layouts, probably my favorite thing to scrap. I saw your goals, that is fantastic. I'm an addicted scrapper too and would like to avg a layout a day too this year. Good Luck, I'm sure you can do it, you are off to a good start. Love the Christmas layout! It's hard to get the Santa pics when they get older, so I'm sure this is one you will treasure. Beautiful layout! Love the big 25! Great work with the sketch! I love your bits of twine and the "25" square! Great holiday page! Awesome layout. Thanks for sharing. fabulous layout Tracy, love the chevrons down the side. I really love the Christmas layout! It's Great!! Wonderful Christmas page....thanks for the inspiration! what a wonderful christmas page.. love whole thing. What a special Christmas page. A wonderful use of the sketch. Very nice.